Moon Anchor Mine - Issued by C. C. & Gold Hill Ry. Co. Sadly, a not that great printed image of the Moon-Anchor mine structure on Gold Hill. One can see the shape and count windows, and that there are several structures seen here, but not much of details can be seen. I think the smaller peaked roof structure seen just below the ore-house part of the Moon-Anchor is the old Anchor Shaft House. In the background, just left of the two large smokestacks, the shaft house of the Anchoria-Leland is seen poking up from behind a dump, and the card is preprinted with 190 so it is made from 1900 onward, and possible the image dated then to 1899 or early 1900. Postcard; Published by C. C. & G. H. Ry. Co.; titled Moon Anchor Mine - Issued by C. C. & Gold Hill Ry. Co. - Published in ????. My Website: ⊞ Postcards Overview; Moon Anchor Mine - Issued by C. C. & Gold Hill Ry. 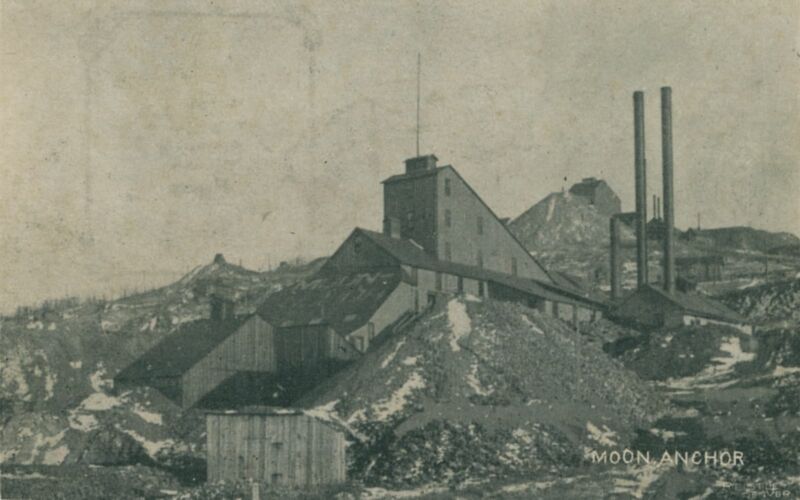 Co.
My Website: ⊞ Postcard; Cropped; Moon Anchor Mine - Issued by C. C. & Gold Hill Ry. Co. This view and similar angled ones must be the most common view of Cripple Creek I believe! I've seen them in dozens of postcards, photographs in books and other printed mediums, and in at least a couple of variations. While this particular edition is by time of writing (28.03.2018) known to me with 12 uses ranging from postcard folders to postcards them self, but I don't have an overview of uses in books except for a very few books, so I assume that number will grow larger if I ever get around to make list of images used in all books I've seen. In foreground left, about 1/4 up from bottom and about 1/7 in from left-hand side is the surface structures of the Moon-Anchor mine, with the roadbed of the High Line electric, and the Short Line railroad, on this side of the structure, even if this is not the best view to pick those out though. Near Bottom of the image the original High Line Electric roadbed is seen climbing from left and disappearing about center sideways at the bottom. Can also be seen coming uphill from almost bottom right, where if the view had been a better one, one should have seen both the Trolley Line and the Short Line tracks run uphill from right towards left. My Collection; View is number 18 in a Postcard Folder called Souvenir Folding Card of the Cripple Creek District. no. 18; Souvenir Postcard Folder titled Souvenir Folding Card of the Cripple Creek District - Published in ????. no. 20; Souvenir Postcard Folder titled The Greatest Gold Camp On Earth. Souvenir Folding Card of Cripple Creek District - Published in ????. no. 15; Folding Book titled A Chain of Gold Cities in the Cripple Creek District; published around 1905 - Published in 1905. Postcard; unknown Publisher; titled Bird's-Eye View, Cripple Creek, Colo. - Published in ????. Postcard; Published by Owen Bros. Co.; Numbered 1560 G. [also 96818]; titled Bird's Eye View of Cripple Creek, Colo. - Published in ????. Postcard; unknown Publisher; titled Cripple Creek, Colorado. - Published in ????. Postcard; unknown Publisher; titled Bird's Eye View of Cripple Creek, Colo. - Published in ????. Postcard; Published by The Bay State Novelty Company; Numbered 1627 G,; titled Bird's Eye View of Cripple Creek, Colo.; crop version difference - Published in ????. My Website: ⊞ Postcards Overview; Cripple Creek, Colorado. While the image quality is not that great due to the very limited size of the digital image, I still recognize this as a view from along Short Line railroad, climbing Gold Hill, looking down passed the Moon-Anchor Mine (on the right-hand side) towards the northeastern portion of the town of Cripple Creek. Sadly, the lousy image size with its 480-pixel wide view makes it hard to pick out much details. This view is the right-side part of a three-pic panorama [832A+832C+832B] from this location, which is along the Short Line and High Line tracks up Gold Hill, just after it passed the Moon-Anchor and as the tracks is turning southeast along the hillside. This is actually a good view of the Moon-Anchor from a side not often seen, most often the backside is seen, as in this view, but more from a northern side, this is more from the southern side. Not the best photo, hand-colored and not very sharp in the first place. Blurred edges left and right, quite many scratches and damages to the photo itself, but still a good idea on how Gold Hill looked around September 1899 when this photo was taken. There is handwriting saying Copyright 1899 by E.A. Yelton, Photographer at 357 E. Bennett Ave., with what appears to be written Sunday Sep. 20-99 below there, but September 20, 1899 was a Wednesday, August same year has a Sunday 20th, but I am not sure what to trust, the date or the day, hence I went for the date and thought the Day was just a calculating error from whoever wrote the date. * Near lower left-hand bottom/corner is the Cripple Creek Depot structure of Midland Terminal. * Near lower right-hand side is seen part of the Midland Sampler with a string of boxcars in front of, and its Office Structure east of the Sampler building. * Up on top of Gold Hill, is seen the Half Moon Mine structure, nearly 2/5 in from left-hand side and a small bit more than 2/5 up from bottom. Painted reddish and seen partly sideways, with some lighter shades of some image damages poking into the sky from it. * Further to the right of the Half Moon is the structures of the Anchoria Leland Mine seen about middle of view sideways and a small bit more than 2/5 up from bottom. It's look make it an easy mine to spot I think. * Even further to the right, a little lower than ridgeline of Gold Hill, is seen the Moon-Anchor Mine, a little bit more than 1/3 in from right-hand side and about 3/8 up from bottom. Several other shaft houses are seen, but their names escape my memory for the time being, neither them, or any other the structures in this view, is really useful for any other purposes then to see where on God Hill they was located, hard to use them for a modelling purpose for instance and there is not much details to see. Moon-Anchor Mine, Sold in England for $900,000. This sadly bad quality view shows the Mine looking at it from the east, showing it real close-up with the words Moon Anchor G.M. Co. clearly visible on the roof covering the head frame. You also see three sliding doors covering up two openings on the backside left - most likely for bringing in coal and other stuff. Further to the right, a couple of men is posing. This mine has in this view three smokestacks, various heights. In the background is the town of Cripple Creek barely seen in the bad print quality of this view, also part of the Short Line grade climbing Gold Hill is seen near lower left corner. My Collection; View is from page 16 in the July 1902 edition of the Official Guide to Cripple Creek District. Page 16; Official Guide to Cripple Creek District, July 1902 (Vol. 1, No. 2) - Published in 1902. Midget Mine on Gold Hill with Moon-Anchor in the Background. This view shows the Midget Mine structures with the large Moon-Anchor mine poking up in the background on the left half part. It is quite a nice view, good for modeling purposes. My Collection; Scanned from a photograph.